Take a self-guided tour along the talcum powder beach and watch for dolphins rising out from the emerald green sea. Watch the rainbow shaded parasails float across the bright blue sky. Jellybean colored catamarans glide swiftly over the water in silent competition with the neon-striped sails of wind surfers. Red and white wave runners speed across the surface spilling white froth in their wake. Take a scenic cruise on the Glass Bottom Boat 11. Try a sailing adventure on a modern sloop-rigged yacht. Destin harbor offers several watercraft rentals. Rentals are also available at water front resorts. Paradise Water Sports rents equipment and offers parasailing rides at seven locations. Destin has a large charter boat fleet based at marinas along the north shore. An inexpensive group fishing expedition or party boats are available, with full days, half days and non-fishing sightseers. If your sea legs are shaky try fishing from the catwalk of the 3,000-foot Destin Bridge over East Pass. Try scuba diving or snorkeling with many dive shops located along the beaches. Scuba charters include open waters, with resort courses also available. Snorkeling excursions in the Gulf of Mexico and Choctawhatchee Bay includes gear. Florida is referred to as the "Golf Coast." Golf is available 365 days a year. Sandestin offers 63 holes located in a superb oasis, surrounded by lush greenery, ponds and striking high rises. There are five championship courses within a fifteen-mile radius. 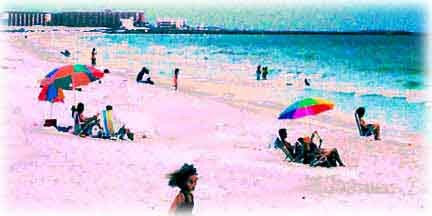 There is an excellent choice of public and semi-private courses along the emerald coast. Tennis, racquetball and fitness centers flourish in Destin. Attractions other than the beautiful beach. January boast the annual Gumbo cook-off. Restaurants compete in the elite gumbo extravaganza, with only three winning the prestigious award for excellence. May is music month. Trumpets, sax and clarinets make a merry melody along the harbor. 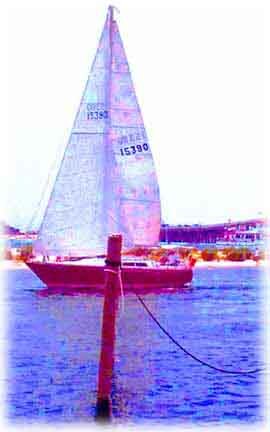 Across the harbor in Fort Walton Beach watch as the Hog's Breath Hobie Regatta takes control of the waterways. Theme parks, amusement parks, water parks, aquariums, museums, botanical gardens and zoo's are only minutes away. The Museum of the Sea and Indian is located on highway 98. It is closed the week of Christmas. A fantastic display of Indian artifacts and ocean paraphernalia fill the museum for education and inspiration. 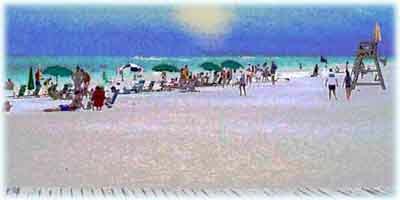 Motels, Hotels, Inns, Cottages, Resorts, Condos, Golf Villas, and private homes are plentiful on the Gulf and overlooking Choctawatchee Bay. Rates are lowest during the winter. Summer is prime time and rates are higher, although still reasonable. Some establishments offer golf packages. Many locations have heated pools, free HBO, laundry facilities, equipped kitchens, and on site restaurants. Guests are pampered with lighted tennis courts, exercise rooms, game rooms, beach volleyball, sauna's and beachfront snack bars. Jetty East offers conference rooms and private party rooms with kitchen facilities. No need to drag beach furniture along on your journey; several hotels provide beach equipment such as chairs, umbrella's, bicycles, etc. Rental shops are also located in the downtown area. Shopping includes Outlet Malls, expensive upscale gift shops and a variety of beach shops. The Market at Sandestin sells Godiva chocolates. Have burgers at The Back Porch or seafood at Harbor Docks. Harry T's House is an absolute must-see and say hello to Stretch. The elegant Elephant Walk is brimming with history. John Whiley a tea planter in Ceylon tried to protect his trees from the roving bands of elephants. He built a huge home across the elephant's path to the river. Unfortunately, this did not hinder the elephants. The house was left in ruins. Whiley left and vowed never to return. He roamed the world for thirty years acquiring treasures. He finally settled in North West Florida. His purchases are on display in a building representing his Ceylon mansion. This building is the Elephant Walk Restaurant.